Spring is here and I thought I would share a recipe that is ideal for this time of year, it can be served with so many different sides dished depending on the day and who you are going to be sharing the meal with. Chicken is a regular on the menu in our house, so I am always looking for new things to do with it. 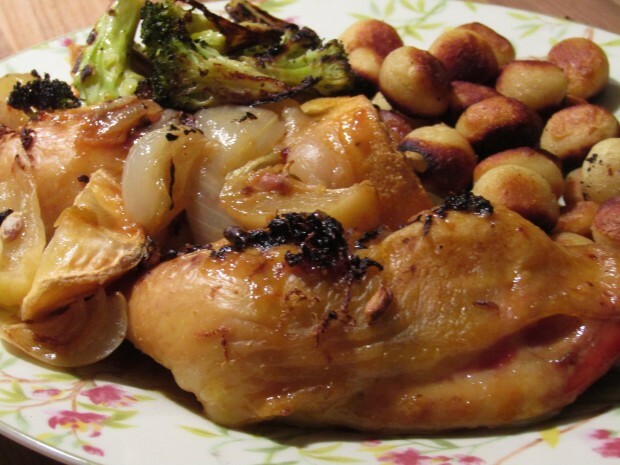 A slow roasted chicken dish that just melts in the mouth. Don’t get me wrong I love cooking and being in the kitchen, but sometimes it’s great to just put everything together in the oven and then get on with the other elements, either the sides for the dish or the dessert maybe. 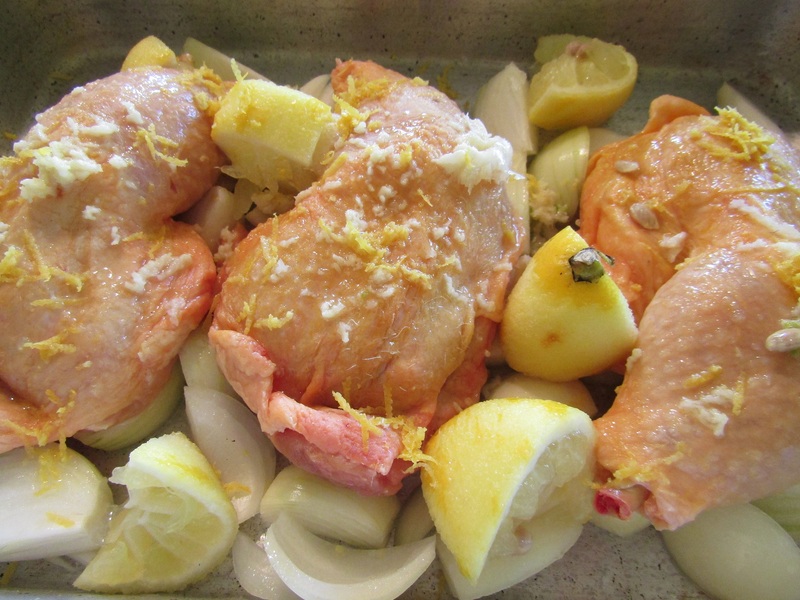 The house is always filled with fantastic smells when this is cooking, the heady mix of lemons and garlic…. just delicious. This recipe works better with chicken on the bone, the long slow roasting tenderises the chicken and the meat just falls off the bone when it is finished cooking with all the flavours cooked into the chicken. Depending on how many people are coming to dinner I usually work on 1 chicken leg (thigh included) per person, with a few additional, just in case. Using a roasting tray that is just big enough to hold all the chicken, chopped and add the onions to the bottom of the roasting tray and then place the chicken in top, then top with the crushed garlic and lemon zest and then squeeze the chopped lemon over the chicken before pouring in the chicken stock into the baking tin, and season with salt and pepper. Tip : using a baking tray ‘just’ big enough, ensures chicken can cook in the juices that are released. If the tray is too big, the juices are usually lost and cook away. I pre-heat the oven to 160c conventional/140c fan/Gas 3, and then pop the tray into the oven, I usually leave the chickens in the oven for 1 hr before checking how they are doing, then go for another hour and then after that it will depend on how brown and crispy they are on top. As long as there is still some liquid in the bottom of the roasting tray your chicken will be succulent and moist. This chicken can be served hot, warm or cold, depends on what you are serving with it. For this dish I was serving the whole plate as a hot dish, so I left the cooking until about 2 and half hours before it was being platted up and left the chicken in the oven until I was ready. I like to have a bit of sauce with my chicken, so I usually pour off some of the roasting pan juices into a pot, bring it to the boil and add a little cornflour and water mix and stir until I have the consistency I want. 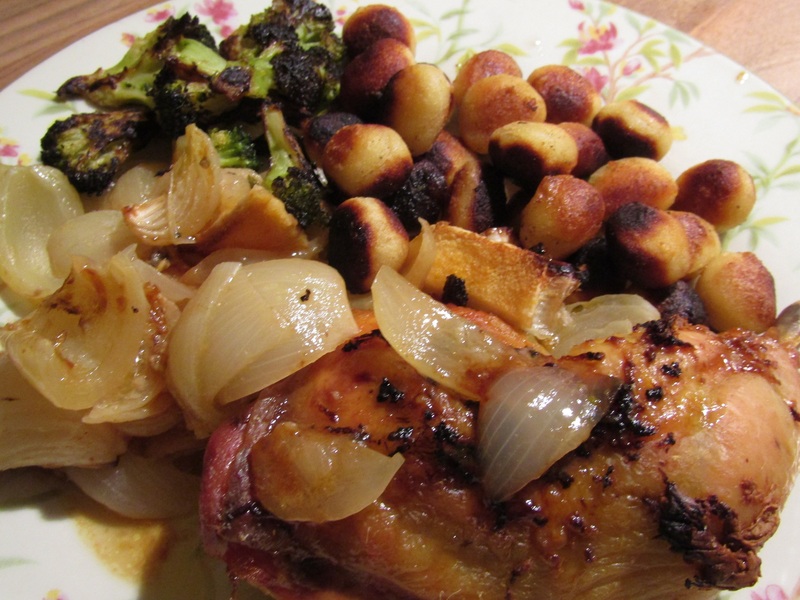 I served it with roasted broccoli and pan-fried gnocchi, it was absolutely delicious, I do hope you enjoy it too. 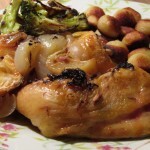 Delicious chicken dish with fantastic lemon and garlic cooked into the meat. Perfect for an alternative Sunday lunch or even cold on a buffet table. Pre-heat the oven 160c conventional/140c fan/Gas 3. Peel and chop the onions, toss them into the baking tin. Place the chicken legs on top of the onions. Crush the garlic over the chicken legs, then zest the lemon and add to the top of the chicken legs, chop lemon into pieces, and squeeze over the chicken. Make up the chicken stock with the knorr chicken stock pot and 200ml of boiling water and add to the roasting tin. Pour the stock around the chicken so as not to 'wash' the lemon and garlic off of the chicken legs. Place the roasting tray into the oven and back for 1 hr, remove the chicken from the oven and check that there is enough liquid in the base of the tin. Spoon some of the liquid from the bottom over the chicken legs and return the chicken to the oven for a further 1 hr until the chicken skin is crispy and golden. Remove the roasting tray from the oven and pour off some of the juices from the tray, into a sauce pan and bring to a slow simmer. Place the cornflour into a cup/jug and add 2-3 tablespoons of cold water. You are looking for the consistency of milk. When the juices in the pot are simmering, slowly pour some of the cornflour mixture into the sauce pan, stirring as you do. Pour just enough of the cornflour mixture to get a nice coating consistency, not too wet, not too thick. Once you have the right consistency, turn off the heat until ready to use. Place some of the onions from the tray onto a plate and then top with the chicken legs, place a piece of the roast lemons onto the plate and serve. Ensure the roasting tin is just big enough for all the ingredients to ensure that the mixture stays moist and succulent. If you are making the chicken ahead, when it is fully cooked remove the roasting tray from the oven and cover with tin foil until it is required.